Each letter of the alphabet has been swapped with a number, from 1 - 26. Each number represents a different letter of the alphabet, and this changes from puzzle to puzzle. So in puzzle 1, the number 6 represents the letter P. This means that you should go through the puzzle grid, and enter the letter 'P' everytime you see the number 6 in the grid. As you'll see, we give you some letters at the start of each puzzle. As the puzzles get harder, you are given less starting letters. Every letter from A - Z always appears at least once in every puzzle, so it is a good idea to cross-off each letter as you find it in the bar of letters directly underneath the grid. And when you work out the identity of a new number, remember to record it in the number and letter key at the bottom of each puzzle. If you are unsure of the rules, then take a quick peek at the first solution to see how it works. The aim of the game is to work out the number that represents all 26 letters of the alphabet, and to complete the puzzle grid. The end result will be a valid crossword solution, filled with words you'll find in the dictionary. 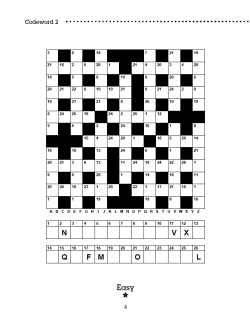 Good luck - we hope you enjoy solving these codeword puzzles. 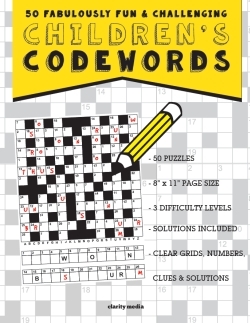 If you can get through all 50, then you are a champion codeword solver!